On 18 March 2017, NAVA welcomed the announcement by the Arts Minister, Mitch Fifield that there will be partial return of funds from the Catalyst Fund to the Australia Council. NAVA hopes that this signals the Government’s new interest in implementing its stated intention to stimulate creativity and innovation, by recognising with increased funding, the essential role of the arts, including in the innovation agenda. Read NAVA's full response here. Follow the latest updates on visual arts funding and how this affects NAVA, visual arts organisations and artists. In the 2014 Federal Budget, cuts were made to the Australia Council’s appropriation of $28.2m over four years. In further cuts to the 2014 budget, the large Canberra-based cultural organisations had their back office functions amalgamated to save $2.4 million over four years (the National Film and Sound Archive, the National Portrait Gallery, National Gallery of Australia, National Library of Australia, Old Parliament House and the National Archives of Australia). In the 2015 Federal Budget, the Government announced that $104.8M would be removed over four years from the Australia Council's funding. The sector response to this announcement was loud and critical. A Senate Inquiry into the impact of the 2014 and 2015 Commonwealth Budget decisions on the arts was called in June 2015 and the report was tabled in December 2015. On Friday 13 May 2016, the Australia Council announced the result of the arts organisational funding round which provides 4 year operational support to small to medium and major organisations. Congratulations to the 128 organisations who received funding and especially the 17 Indigenous organisations. This funding is a well deserved investment in the Australian arts. With this announcement came the devastating news that NAVA, alongside 64 other organisations, did not receive funding. These key organisations are vital to the health of the arts ecology and the impact will be felt far and wide. This now means that the essential services NAVA has been providing to the visual and media arts, craft and design sector are under serious threat. NAVA has made some internal changes and will continue to provide a number of grants, services, investment and support for visual artists in 2017, including our insurance package containing cover for public liability, personal accident and the new goods in transit cover. While this loss of funding is a major setback and poses a significant challenge for NAVA, there are ways you can help. One way is to become a member, or if you are already, encouraging others to join. We ask you, our members, subscribers and supporters to get behind NAVA, to take action and call for a reversal of the cuts. why you are a member of NAVA and why you believe NAVA is an important organisation. 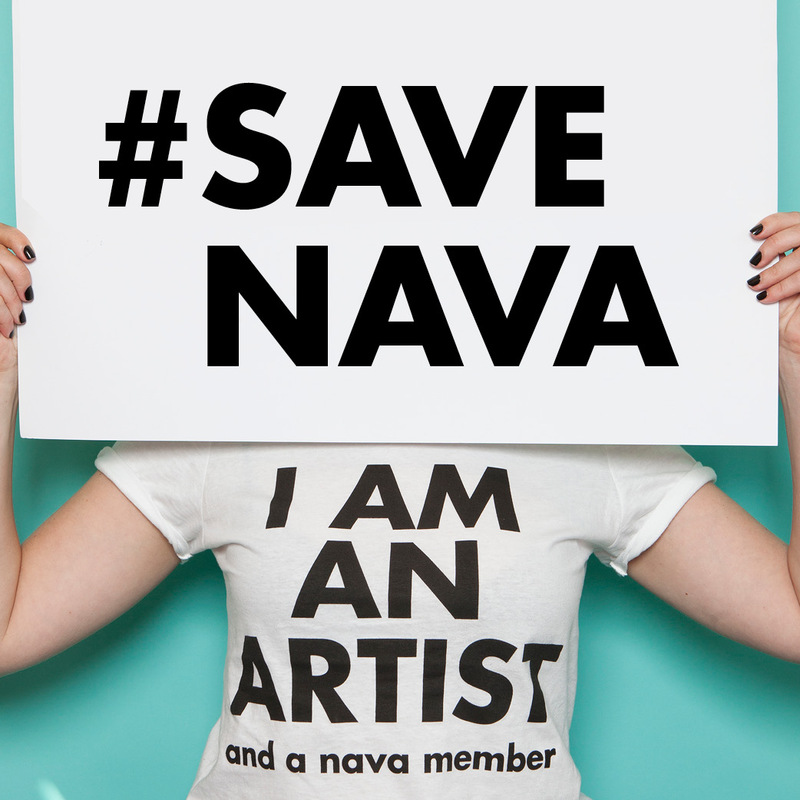 We had asked you to sign our petition urging the Australia Council for the Arts to find a way to fund NAVA and secure the future for the visual arts, craft and design sector. Our very grateful thanks go to the almost 2,000 people who pledged their support. This petition was delivered in 2016 to Rupert Myer, Chair of the Australia Council for the Arts. If NAVA was to double its number of paying Members we could continue unharmed. So if you are currently a free subscriber, please consider upgrading your membership to a NAVA Premium or Premium Plus, and if you are already a member, get a friend to join as well. Each paid membership shows your support and will help us continue our work! Please share this link across your social media networks. Make a tax deductible donation and help NAVA to be able to survive this devastating reduction of our resources. In response to the recent Australia Council funding decisions, the lack of consultation around changes to arms length funding, and lack of government arts policy or inclusion in the 'innovation agenda', the arts sector called for a National Day of Action on 17 June 2016. NAVA and Artspace hosted three 'town hall' public discussions exploring the current arts funding landscape. At the first event held on Monday 30 May, organisations, colleagues, artists, and independent practitioners who have been affected by the recent Australia Council funding announcements were invited to air their concerns, listen to those affected, and discuss how this would affect our sector. In the second 'Let's Talk' we discussed what actions to take in the lead up to and after the election. In the final 'Let's Talk' for 2016, a conversation was held with the Directors of Contemporary Art Organisations (CAO) from across Australia with a focus on how we should value the small to medium sector. Contemporary Art Organisations Australia (CAOS) a 25-year-old national network of 14 independent art spaces, issued a statement from the visual arts sector in response to the outcome of Australia Council 4 Year Funding. "Audience numbers for visual art are up. Australian artists are driving the innovation agenda and are recognised globally. There has never been a more significant time to invest in innovation and creativity: and still our arts are in CAOs. The announcement by the Australia Council that 65 organisations will no longer receive funding under its Four-Year Funding program (previously Key Organisations) delivers a major blow to Australia’s contemporary visual arts sector." You can show your support of NAVA by sharing this image, hashtag #saveNAVA and the below link across social media and online spreading the message far and wide. NAVA would like to sincerely thank all our members, artists and supporters who have sent us well wishes, written letters on our behalf, joined as members or made donations. Every action helps!